On February 6, 2015, RadioShack finally got “permission” to close 1,784 of its store locations in every state of the U.S. (and Puerto Rico) where it has physical retail store locations. Naturally, after that store closing announcement, consumers, retailers, and RadioShack stock investors immediately wanted to know which locations would be closing in which states. California is the state that will be hardest hit by the 2015 RadioShack store closings. At least 191 RadioShack retail stores located in California will be closing in 2015. Close behind California, the New York RadioShack store closings will total 144, Texas RadioShack store closings will total 143, and the total number of Florida RadioShack store closings will be 117. Below is a complete list of California store closing locations planned for 2015, including the shopping center and mall locations where the RadioShack store are currently located and store addresses. Going out of business sales were scheduled to begin at all of these RadioShack locations on February 6, 2015, with no definite final sales dates specified. BOOKMARK THIS PAGE and return for updates about final store closing dates and additional 2015 California RadioShack store closing locations as official information is made available from RadioShack. 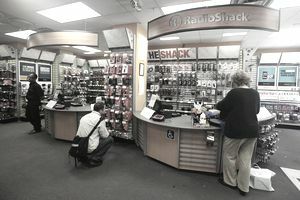 RadioShack is just one of the largest U.S. retail chains that are closing a substantial number of retail store locations in the state of California in 2015. Macy’s, Wet Seal, Cache, and Abercrombie & Fitch are also closing stores throughout the state of California in 2015. How many California RadioShack electronics stores will close in Los Angeles, San Diego, Orange County, San Francisco, San Jose, Fresno in 2015? This has been a frequently asked question since the RadioShack corporation announced that it would be closing a total of 1,784 of its retail store locations positioned across the U.S. and in Puerto Rico. What follows is a complete list of RadioShack store closings that will be happening in cities throughout the state of California in the 2015 calendar year. BOOKMARK THIS PAGE and return for updates about final store closing dates and additional 2015 California RadioShack store closing locations as official information is made available from RadioShack. Which 2015 RadioShack Store Closings Are Locations in Texas Cities?